Another great photo of Flint in the fifties by Mary Fisher. 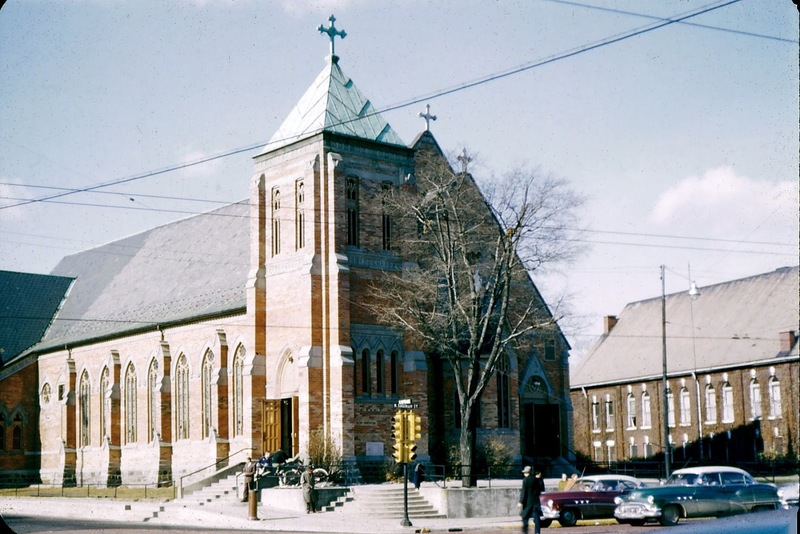 I was just talking to a friend who mentioned that he'd heard the old St. Mike's in this picture has some fairly serious structural problems by the time the new St. Mike's was built in the sixties. Anyone have any info on the condition of the old church when it was demolished? That is what we heard back then. Of course, stupid grade schoolers didn't know what that meant. I always loved the steps up to the church. My parents were married here in 1951, but the photos are lost in the house that was foreclosed on. So thanks for posting this. I will have to imagine the wedding remnants outside. The shrine to the right in the back between the two buildings was a favorite photo place when we were little. There is another story here that seems to have been sanitized, besides the Keith Moon drives a car into the pool at the Holiday Inn in Flint....Township story. It is the connection between St. Mikes and the Bill Ayers Flint War Council/SDS Meeting circa 1969. The sanitized Wikipedia version says the meeting was held in a dance hall in the middle of the ghetto. But as many recall, this was held in a social hall or basement either next to or somehow connected with St. Michael's Church. Does anyone else remember this? Yes, it could be considered to be in the middle of the ghetto now, but not then. I'm sure that the Church hierarchy would not have allowed this, but there were a lot of radicalized clergy of every religion and denomination who would have looked the other way. Those radicalized elements still exist in large cities like the one Ayers came from. there from the school campus. There was no connection at all with St. Mikes to this event. Yes, Bill Ayers was there from Chicago. Obama was a live in guest with Ayers family later on. I remember this from experiencing one of those cold nights. Right CHURCH, wrong Pew, er, Parish. A part of this old church lived on. Just before it was torn down, circa 1965, St. Michaels' ecclesiastically ornate pendant ceiling light fixtures were moved to St. Agnes church. They were a welcome addition, replacing the nasty fluorescent 'shop lights' that had been in that buildling since 1942, when it was built. The old St. Mike's lights were still there the last time I was at St. Agnes for a funeral a few years before it was closed in 2008. They could very well remain there today. I also have an old postcard image of this building from the 1880s showing an enormous steeple that had originally been where the truncated version is in Ms. Fisher's posted photograph. It easily doubled the height of the building relative to the configuration shown here. It was not all that unusual for these older churches to lose their towers due to lightning strikes, wind storms, and inadequate initial structural design/construction.